Internet of Things (IoT) technology deployments have increased across the globe, as more CIOs and CTOs explore new commercial applications. However, many organizations continue to seek IoT solutions that include comprehensive data protection capabilities. Security continues to be a major concern for IT professionals when deploying IoT projects within their organizations, according to the latest worldwide market study by 451 Research. 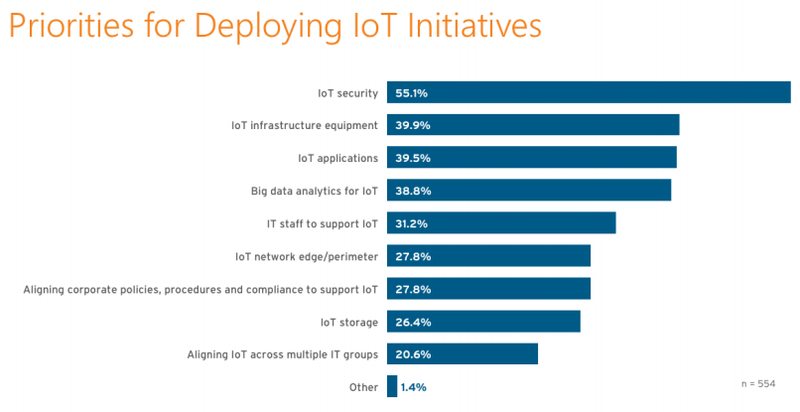 When asked to rank which technologies or processes their organizations considered for current or planned IoT initiatives, 55 percent of respondents ranked IoT security as their top priority. As 451 Research data consistently shows, security is a headwind that must be overcome. Survey respondents have consistently rated IoT security as their highest priority – but why? "The nature of IoT deployments make them particularly difficult to secure against cyber threats," said Brian Partridge, vice president at 451 Research. “As industrial equipment is increasingly connected to the Internet for data collection and analysis, enterprises open themselves to the sophisticated world of security intrusions." IoT projects often straddle OT and IT domains, which have struggled independently to secure against internal and external threats. When these domains come together driven by IoT, the overall attack surface can increase exponentially. According to 451 Research analysts, some business leaders have stayed on the sidelines of IoT because they believe the risks are still too high against potential returns, but for those that do initiate IoT projects, security is still a top priority. Beyond extolling IoT security as the top requirement in their IoT deployments, enterprises value security capabilities as the top reason for choosing a commercial IoT platform, with 58 percent of survey respondents ranking it as the top attribute in choosing a vendor partner. Furthermore, in an IoT Workloads survey in 2017, enterprises ranked the IoT attack vectors that most concerned them. At the top of this list were poor authentication of IoT endpoints such as sensors and network modules (64.3 percent), unsecured enterprise IoT applications (63 percent) and vulnerabilities in how end users access their IoT devices and applications. So where’s the opportunity for IoT providers? According to Brian Partridge, "The silver lining in all of this is that IoT security breaches have raised overall awareness of the issues and consequences when ‘things’ go wrong." It’s also raised the bar for suppliers who are increasingly fighting for deals based on their security credibility. There's still a need for trusted vendors and services providers that can bring IoT security together holistically for their customers.